This is our concept belt system, designed to fill the traditional battle belt roll while maintaining a very streamlined footprint. It is in the prototype phase so there may still be some design changes. The system consists of liner belt, modular sleeve and a main belt. The liner belt replaces your regular pants belt and features a low profile Velcro closure. The outer face is covered with Velcro loop, which engages the modular sleeve and prevents the system from shifting or riding up. The sleeve itself is only three inches tall and less than 3/8" thick. At it's core, It is constructed out of a proprietary combination of LDPE and Neoprene, making it an excellent blend of flexibility and rigidity. The outside of the sleeve is made up of segmented panels, beneath which there is a two inch channel for the main belt to pass through. The panels allow the user to route the main belt along the outside to attach belt mounted accessories. As well, at the bottom of each panel there is a slot that allows access to the inside channel for the attachment of sub-loads. The main belt pictured here is a prototype that features an AustriAlpin D-Ring Cobra buckle. It's made from a single layer of 1.5" Nylon webbing, and is for testing purposes only. With this system, the user can swap in most standard rigger's belts as their main belt. These are the latest shots of our Duty/Battle/Utility belt. We are calling it the Raider Belt. 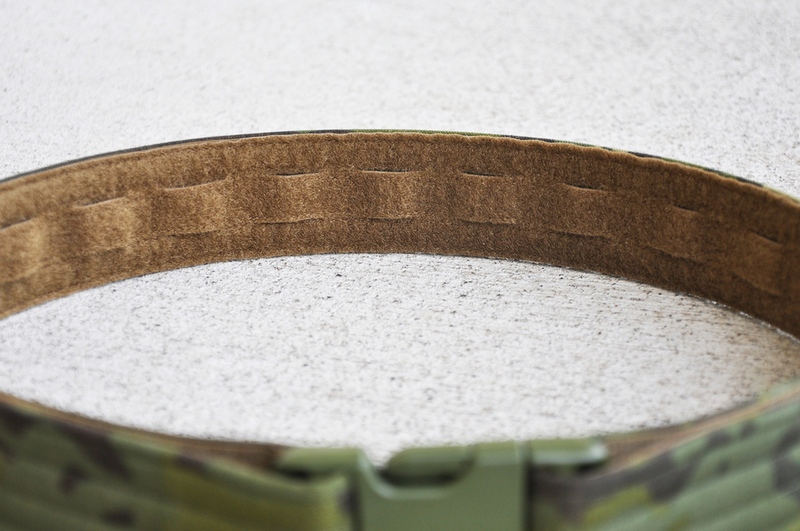 This belt can fill the roll of a traditional duty belt, but can also be able to be scaled up to fill the battle belt roll. It's 2" wide and can be easily adjusted in the front by simply repositioning the Velcro'd down front ends. There will also be removable keepers in the production version. The core is made from HDPE making it very rigid while the ends seamlessly transition to LDPE, which allows them to be flexible. The belt features a liner that is constructed of hypalon and covered in loop Velcro (this will be colour matched on the production version). The liner has slots cutout to allow indexing of PALS compatible pouches or accessories. For the buckle, we used an ITW side release buckle, which is not only durable, but simple to operate with gloved hands. This is a pad system that we've developed to work with the Raider Belt or any other belt with a Velcro Loop backing. It consists of three 10" Velcro backed pads that are 3" wide and 1/4" thick. The pads are constructed of 500D Cordura, closed cell foam and mil-spec velcro. They can be added or removed as desired to change the way your belt feels and reduce any pressure points from holsters or mag pouches. With the addition of the pad system, the Raider Belt is capable of acting as a stand-alone battle belt and is suitable for all types of operations. The belt pictured is in MultiCam Tropic and features a holster and double mag carrier in OD Green from Solely Canadian.